Simple yet a striking classic, you'll never disappoint with our 2-piece bandage set. 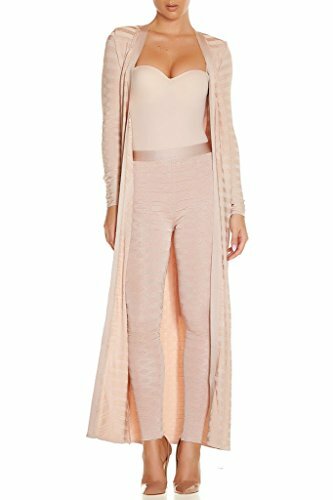 Rendered in soft stretch bandage fabric, this set features a long trench coat with attached tie belt design, and skinny, high-waisted pants. Timeless pieces that would pair effortlessly together or apart, this fabulous two-piece set is the ultimate combination of comfort and luxe style. XS, cardigan length:50½", pants length:36¾", bust:30-31", waist:23½-25¼", hip:30¾-31½"
S , cardigan length:50½", pants length:36¾", bust:31½-33", waist:25½-27¼", hip:31¾-33"
M , cardigan length:50½", pants length:36¾", bust:33½-35", waist:27½-29", hip:33½-35¾"
L , cardigan length:50½", pants length:36¾", bust:35½-37½", waist:29½-31½", hip:36¼-38¼"
*Note: There may be slight inaccuracy in manual measurement. Therefore the range of 3cm is acceptable. Thank you. Color may vary due to lighting on images. The actual photos (without model) are closest to the true color of the product. 1 * trench duster coat. If you have any questions about this product by S Curve, contact us by completing and submitting the form below. If you are looking for a specif part number, please include it with your message.